-Unlimited timothy hay. Alfalfa can be given as treats, but only rarely as it causes health problems (bladder stones, obesity, etc.). 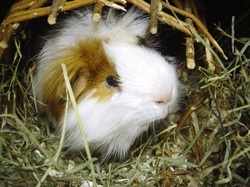 Only young guinea pigs (under 6 months) should be allowed access to alfalfa hay). -1/8 cup of pellets a day, per pig. Adults should have timothy based pellets. 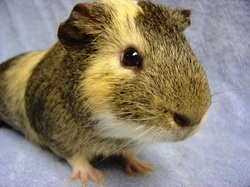 For young Guinea pigs (under 4 months), unlimited alfalfa pellets while they are growing. - Remove uneaten food after 24 hours. -Do not go cheap with pellets; they are very important for nutrition. DO NOT buy pellets with nuts, seeds or fruits in them as they are very bad for guinea pigs. -2-3 servings of vegetables/fruits a day. -lettuce (pre-washed mixes are good, no iceberg lettuce), spinach (sparingly), dandelion greens, endive, carrots, cucumber, celery, peppers, broccoli, apples, berries (strawberry tops they love), oranges, etc. Vegetables should be fed more than fruits (fruits no more than once or twice a week). They need LOTS of Vitamin C found in lettuces and many other vegetables and fruits! -Bedding should be aspen or unscented recycled newspaper (carefresh). Cedar and Pine should not be used, oils in them can poison a guinea pig. -Guinea pigs can get stepped on and dropped very easily, which is usually deadly. -Always carry guinea pigs while supporting their rear and their front. -Example: Wood blocks (untreated and unpainted), cardboard tubes (as long as they can’t get their head stuck), hanging wooden bird toys, etc. Guinea pigs only require vet visits if something is wrong. Lethargy, nasal discharge, and not eating are bad signs, which require vet care. Find a guinea pig vet before something goes wrong so you have them on hand (See our vets section).